Description: Another martial arts inspired knife designed by Fred Perrin. This time with the help of two other French Knifemakers: Philippe Perotti and Sacha Thiel. The knife’s namesake is derived from the first letter of their last names. 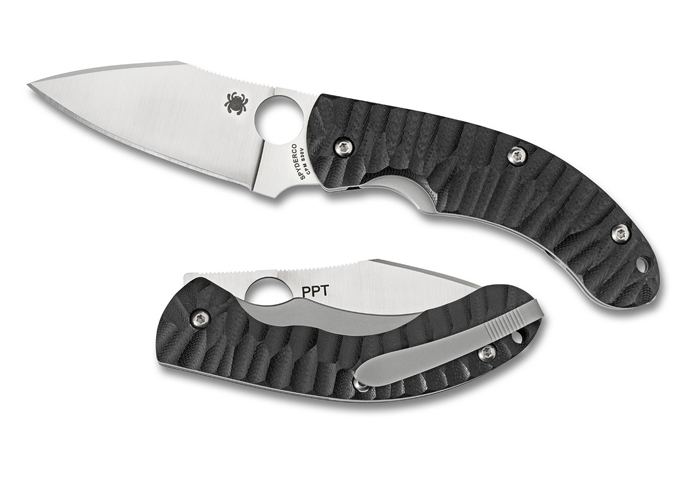 Like many of the newer Spydies coming out, this one features S30V steel shipped out to Taiwan to be manufactured to reduce costs. The location of manufacture is apparently not marked on the Perrin PPT. This entry was posted on Tuesday, June 15th, 2010 at 5:36 pm	and is filed under Designer - Fred Perrin, Features - Screw Construction, Handles - G10, Lock - Frame Lock, Manufactured - Taiwan, Steel - CPM-S30V, Type - Folding Knife, Type - Martial Blade Craft, Type - Self-Defense Knives. You can follow any responses to this entry through the RSS 2.0 feed. You can leave a response, or trackback from your own site.